1944... World War II had been raging for 5 years now, 3 of them with the USA fighting alongside the other United Nations. Rationing, Scrap Metal Drives and Austerity Measures marked a "Home Front" that was dedicated to winning the war. All these were needed to drive the mighty machine of industry so that "Rosie the Riveter", wearing her tillman gloves could place the final welds on the next tank, the next airplane, the next ship needed for the war effort. 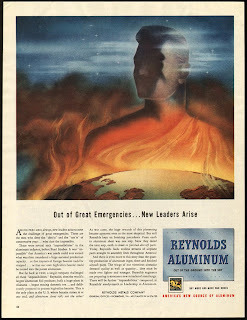 This ad reminds us how much Aluminum was needed for the war effort. Used in the manufacture of Airplanes it was a coveted resource and the new leader that arose was Reynolds Aluminum Co.
Reynolds was a pure example of American innovation. Before 1940 it was thought impossible to produce pure Aluminum from the high silica bauxite ore available here in the USA. Besides, the scoffers proposed, what could ever interfere with imports of foreign bauxite ore? Reynolds put the naysayers in their place in 1940 by building a new plant that took American ore and turned it into the purest aluminum. It was the only factory in the USA where Bauxite went in and Aluminum Sheets came out the other end and it was this that put them in a fine position when the war came. Their innovation didn't stop there though. They soon converted their factory to making aircraft parts that shipped directly to the various factories in the USA. This is why today Reynolds Aluminum commands such a market share... innovation. Not sure what brought u to my blog but curious. I came through Sunday Stealing, sorry I should have said that in my comment. Thanks for coming by.